Dr. Rogers submits that there is a primary group that you should focus on if you want to get a new idea adopted (or make change happen). 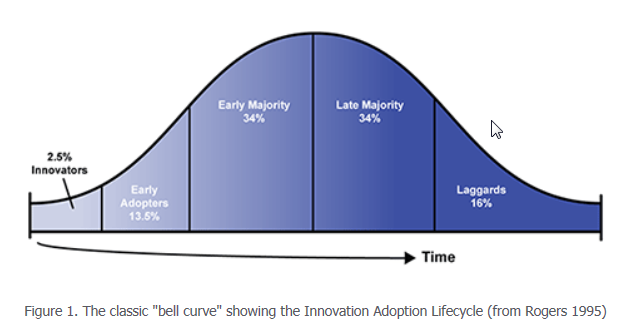 And it is NOT the Early Majority or Late Majority – the 2/3 of the population in the center of the adoption curve. Obviously, it is not the “Laggards”. As the name implies, they are the last to accept anything new and will do so only as a last option. But here is the surprising part. It is NOT the “Innovators” either. Even though these people are the first to try something new, they tend to be social outliers who generally do not have strong influence on their peers. Plus, they only make up 2% – 3% of the organization. Rogers claims that the real power brokers are the “Early Adopters”. These people are also often referred to as “Opinion Leaders”. This group (about 13.5% of the population) is open to new ideas. But the key attribute that makes them valuable as agents of change is that they are respected by a large number of their peers. They are also held in high regard by many people; therefore, they are key links within the network of the organization. It is clear that sustainable change can only happen if the Opinion Leaders can be persuaded to join the cause. If this group can be enlisted, you have the opportunity to reach a tipping point (Malcolm Gladwell’s term) where the rest of the organization will follow their lead and adopt the change. Setting an expectation for team leadership or participation in the personal goals of their organization. There was a focused effort to identify and recruit the true Opinion Leaders to serve as Black Belts in the first three or four years. The decision on who would make a great Black Belt candidate was easy. We would approach the site leader or department manager and ask, “Who are the top three people who are most valuable to you – the ones that you would hate to lose as part of your team?” The answer yielded a strong candidate pool. And where did these future Black Belts reside in the organization? They were recruited from roles as department managers, business leaders, senior sales leaders, production managers, superintendents, etc. They all had a minimum of ten years experience and were well regarded. Once these initial recruits were on board, it was clear to the organization that LSS was not a “flavor-of-the-month.” These were some of the most talented employees, who were plucked from promotion-ready positions to spend a 3-year stint as a full-time Black Belt. As outlined in an earlier post, there are many success factors for an LSS deployment. However, it is not enough to ‘check the box’ on leadership engagement, proactive champions, and full-time black belts. You need to seek out the Opinion Leaders in these three vital groups, who will drive the rest of the organization to the tipping point – and to a sustainable mindset of continuous improvement! Sinek, Simon. (2009). Start With Why. How Great Leaders Inspire Everyone To Take Action. Penguin Group. ISBN 978-1-59184-290-4. Gladwell, Malcolm (2002). The Tipping Point: How Little Things Can Make a Big Difference. Little, Brown, and Company. ISBN-13: 978-0-31634-662-7.